So you’re finally making your life-long dream of seeing Europe come true. Only you’re going it alone. That may put a damper on how excited you are about the trip, but it really shouldn’t. In order to make sure that you have the best possible trip across the Old World, we’ve scoured the Internet high and low. We looked at advice dispensed by the best travel bloggers out there. We asked friends with experience in this field. And for all those planning to travel around the world, we put together a list of tips for the second best travel experience after that – a journey across Europe. 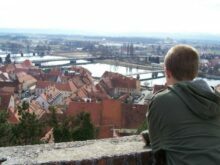 Here’s our concise list of tips for traveling alone in Europe, no matter who you are or what your traveling style is. Be street-smart. This doesn’t have anything to do with where you usually live, but a lot to do with self-confidence and flexibility. Carry cash, a map, and a phrase guide. Take out money from ATMs in broad daylight. Look confident. Approach women or families for help. Avoid dark, shady areas. Use mass transit wisely. Ask the hotel/hostel owner about how safe the local train station is, if you need to wait there at night. Ask for a female compartment companion (this will work in Spain, or even in France, where fulfilling such demands comes at a cost; in others, however, this is impossible). Avoid sleeping alone on the train. Know how to handle men. If you want to avoid unwanted attention, there’s no reason you can’t wear a fake wedding ring. Know that in the south, especially in the Mediterranean, you will receive unwanted attention from men – particularly in countries like Italy, Turkey, Spain, etc.. Be forthright about your boundaries and don’t hesitate to act up if you feel endangered. Bring your student ID along. You have no idea how much money you’ll be saving. From free entrances to museums in most countries, to travel discounts, and even cheaper accommodation, your student ID card is basically your free meal ticket (unfortunately, that’s just a manner of speaking). There are extra perks if you’re under 26, but you can still save some money as an adult post-grad student, for instance. Book wisely. Since you’re probably going to choose a hostel or B&B, be savvy about it. Avoid the fancy ones, since they’re not likely to help you make new friends. Go for those with a kitchen and plenty of lounging areas. PS: free breakfasts are always a nice bonus. Make friends, but be smart about it. Of course you’re going to go out and party, but before you get absolutely smashed with people you barely know, it’s wise to form a bit of a bond with them and see what kind of people they are. Lounge around with them one evening at the hostel – have a few drinks, too, it’ll allow you to gauge their resistance to alcohol. Explore the city. Form trust. Be flexible. You are going to like some places and enjoy others far less. What’s the point of feeling trapped someplace you’re not enjoying, when this is supposed to be the time of your life, right? But I need to plan a trip like this one, alone across Europe, you might say. You can, but you should probably book a Eurail pass, which will allow you to travel flexibly to 24 countries on the continent, all with a single ticket. Shop for food. If you paid heed to the second item on our list of tips for traveling alone in Europe, you’ve already booked a hostel with a kitchen. You can take full advantage of this by spending your cash on food at the closest grocery store nearby. Keep your backpack small. You may find that a larger one won’t fit on all the different types of trains, ferries, and buses in Europe. 2. Know thy train schedule. Here’s the deal – while some countries in Europe, such as those up north or, say, Germany, have very reliable train systems, most of them don’t. Likewise, most staff members at the train station don’t speak English. Make a point of taking down train numbers, stops before you need to get off and all the scheduling details. For travel plans international backpackers can check out Route Planner, which is basically a comprehensive directory of most train schedules in Europe. 3. Avoid camping. Not only is it somewhat unsafe to camp when traveling solo, but you’d also be missing out on all the fun at meeting new people at the hostel. 4. Hostels are not home. Yes, you may have found your hostel room empty when you checked in. Or perhaps you’ve made friends with your roommates. This is no excuse to leave valuable goods or money unattended when you’re not around, because you still don’t know these people, nor do you know if there’s going to be 12 of them there when you get back. 5. Talk to people. Yes, it does go without saying, but it’s about more than just socializing. If you don’t know how to decide where to travel, you can be sure that fellow backpackers you meet at the hostel will be dying to let you know about this awesome city you didn’t know about. Roughly map out the biggest destinations on your route, but stay flexible for the most part. If you talk to other people and get great hints, you never know where you might end up next.